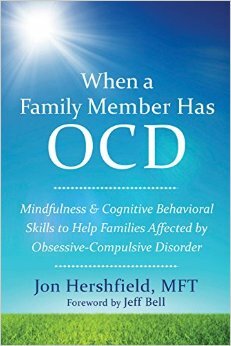 I think I first heard of Jon Hershfield on Twitter — we definitely had OCD in common, so I followed him and always loved what he had to say. And then I kept hearing about him and his first book, The Mindfulness Workbook for OCD, on OCD support pages on Facebook. People love that book! Then we ended up being situated near each other at a book signing at the OCD Conference in Los Angeles in 2014, but we didn’t have a chance to meet. We went the entire conference without being formally introduced, and I thought I’d lost my chance to meet him. As my co-presenter/hotel-mate and I were walking away from the conference after it had ended, she saw Jon and his dad leaving a restaurant and shouted, “Hey, conference people! Hi, conference people!” She’s not as shy as I am, by a long shot. So that’s when I finally met him, after the conference was over, and he was as delightful and sharp in person as he is on Twitter. Since he lived in LA, he was walking home to see his family–but he’s relocating to his first home, the East Coast, in June. His new practice, The OCD and Anxiety Center of Greater Baltimore, will be located in Hunt Valley, Maryland, and will open on June 22. 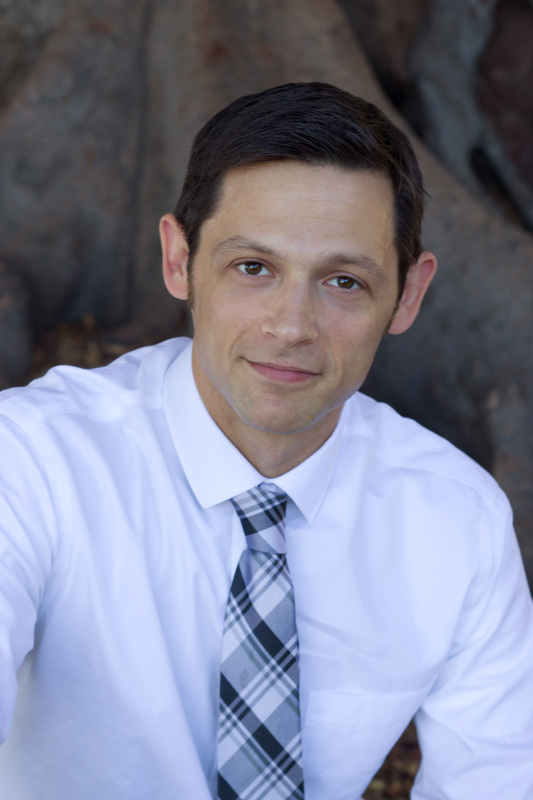 He’s licensed in both Maryland and California, so he’ll continue to work with clients in California via teletherapy, as well as new in-person clients in Maryland, focusing on mindfulness-based cognitive behavioral therapy for OCD. When you decided to go into psychotherapy, did you know you’d end up working so closely with patients with OCD? What is it about this disorder that inspires you to help people struggling with it? I decided to go into psychotherapy specifically because of how much cognitive behavioral therapy (CBT) had helped me in my own journey living with OCD. When I was in the thick of it (both the worst part of my OCD and the hardest parts of treatment), I began contributing to online support groups. 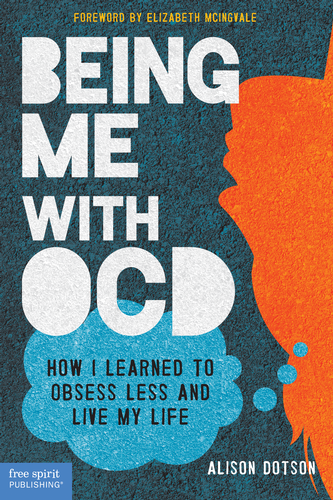 I spent a lot of time reading and responding to emails from other OCD sufferers and discovered that processing the stories of other people with OCD was really helping me better understand the way my own OCD mind works. It was with the support of my wife, my parents, and my therapist that I decided to depart from a career in entertainment and go to graduate school for a masters in clinical psychology. I knew that all I wanted to do was CBT for OCD and actually hit up Dr. Michael Jenike for the recommendation letter in my graduate school application. So perhaps I am biased towards working with OCD sufferers because of my personal connection to the disorder, but I also like to think that people with OCD have truly special minds capable of doing amazing things. They have access to a spectrum of thoughts and creativity that is both awe-inspiring and overwhelmingly painful at the same time. Suffering occurs as a result of not really understanding how that kind of mind works and so using ineffective strategies to try to change it. The idea that we can write our own instruction manuals to better operate this OCD mind is simply fascinating to me. Have you ever worked with a patient with a very severe case of OCD? How did you work through it? I’ve worked with several cases of what I would describe as severe OCD. In my time at the UCLA Child OCD Intensive Outpatient Program, we only saw kids in the significant-to-severe range, and part of the reason we were able to break through the severity barrier was by providing several hours of individual CBT several days/week and incorporating the use of group treatment, parent education, and psychiatric medication management. In a simple private practice, time and resources are more limited. You typically see the OCD sufferer for a little less than an hour once or twice a week. So making progress in a severe case involves a combination of wise time management in session and the use of collateral resources (e.g., working closely with the client’s psychiatrist, bringing the family or spouse in for psycho-education). Sometimes the inclusion of home sessions can make a big difference as well. Severe OCD is as treatable as moderate OCD, so long as it is the OCD that is presenting the primary problem. If depression, for example, is getting in the way of treating the OCD (e.g., by depriving the sufferer of motivation), then that may need to be addressed first. In the end, homework and medication compliance are probably the biggest predictors of whether a severe case will become a moderate or mild case. Of the clients I have seen progress from the darkest depths of OCD to the greatest health, the thing they seem to have had in common was the willingness to let go of the idea that you have to wait to get better before pursuing the things you value (relationships, work, creating art, etc). In those cases, my job was mostly just to discourage waiting and then the exposure and response prevention (ERP) came naturally from that decision. I’ve met several people with OCD over the years, and we all think our own obsessions and compulsions are the worst. We think, “You’ll be fine — all you worry about is inadvertently bringing down civilization because you didn’t wash your hands thoroughly enough. But I obsess about killing my own child.” How do you respond to patients who have this mindset, that they’re somehow the exception who can’t be treated? I think the next DSM should include a criterion for diagnosing OCD that says the person must have a belief that his/her obsession is unique, worse than others, and less treatable. When patients tell me this, I try to remind them that it’s not useful information. If it’s true that this or that obsession is something no one has ever obsessed about and we have to be extra special creative in constructing the treatment, it has no effect on the reality that the OCD is treatable and it’s treatable with CBT/ERP. Overly manualized treatment won’t take you very far. You have to construct the CBT to fit the OCD. So we don’t have to prove anything about how bad the obsession is. We just have to see where the behavior (physical or mental) is keeping this obsession afloat, target it, and change it. Your first book, The Mindfulness Workbook for OCD, has practically been a runaway success in the OCD world. People love it. What inspired you to write it? People have been incorporating mindfulness with CBT for a long time. ERP is about putting yourself in the presence of unwanted thoughts and practicing allowing them to be there without pushing them away. This naturally lends itself to mindfulness. 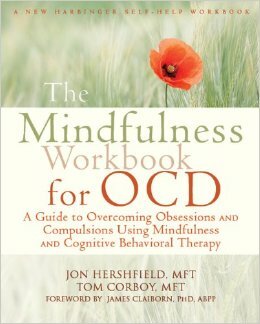 When I was approached by New Harbinger to submit a proposal for an OCD book, The Mindfulness Workbook for OCD just made sense. I’m extremely grateful for the opportunity and love that I was able to reach so many OCD sufferers in a format like this. I was used to writing blogs and, well, really long-winded emails, so a book was quite the learning curve! When you’ve gotten feedback on the book, is there any one section or technique that seems to resonate with your readers? Honestly the part I hear about the most is the preface to Chapter 1 in which I attempt to describe the OCD experience overall, what it’s like from the inside. Many self-help books have examples like “Bob’s story” and so on, but I wanted to have something that every reader with OCD would get, so I put one example and called it “Your story.” This is where I was thinking most personally about the material and I think that must resonate with readers. People also seem grateful for the specific descriptions of mental rituals, which has been scarce in OCD literature so far. Overall I think the book’s strongest element is that it looks at mindfulness not as an alternative or a stand-alone tool, but as something that can be used to enhance OCD treatment in harmony with cognitive therapy and ERP. The best way to help someone through OCD feels so counterintuitive: Don’t reassure the person, and don’t make it easier for her to follow through on her compulsions. That’s why I think your second book, When a Family Member Has OCD, is such an important title. What advice do you give family members and other loved ones who are struggling to understand their role in the recovery process? Family members and other loved ones have to walk a very tricky line between supporting the person with OCD that they care about and also recognizing that this person needs to do their own work to get better. I hope to drive the point home that you can make hard choices to help your family member with compassion and without cruelty. In “When a Family Member Has OCD,” I highlight four potential steps that can be taken to approach this. (1) Identify the compulsions, not the person, as the problem. (2) Invite collaboration on addressing the problem. (3) Interrupt the OCD cycle with permission (this is where “don’t reassure” comes in). (4) Integrate healthy behaviors through modeling non-OCD responses and embracing uncertainty of your own. I have what is (sometimes controversially) referred to as pure O because I never performed the obvious outward compulsions like excessive hand-washing or checking and rechecking. Do you have a different treatment method for folks with pure O? No. The treatment for OCD is CBT, a collection of strategies that includes cognitive restructuring, behavioral modification (ERP), and mindfulness skill development. Mental behaviors, though they may appear automatic and elusive, are nonetheless behaviors, which makes them available for targeting and treating. OCD sufferers tend to notice thoughts that others may be more likely to overlook or find unimpressive. How they address this “noticing” can come in many different forms. But I think it’s important that people recognize something like hand-washing is a physical behavior a person engages in when her mental rituals have failed to produce the relief she’s seeking. As a clinician, I might be able to get her to stop compulsively washing, but if I don’t also address the compulsive mental attempts to feel clean, relapse is inevitable. Speaking of pure O, what do you think of the name for this type of OCD? Do you, for lack of a better word, believe in pure O? As a clinician, it’s a truism that there is no “pure O.” There’s nothing pure about it. You have obsessions, you do compulsions (seen or unseen), it causes disorder in your life and so, you have OCD. That is all. Some people believed for a period of time that there were people with obsessions who were not doing any compulsions and they called them “pure obsessionals” and now we know they were mistaken. In fact, when you consider that the very nature of an obsessive thought is that it is assessed as intrusive and unwanted, that initial assessment is in some ways a compulsion right there, an attempt to disown and dismiss the thought. So if you’re treating OCD and you’re using the term “pure O” to describe a manifestation of OCD, reasonable educated clinicians will frown on this. And for good reason. If you call it something other than OCD, your patients will expect some other kind of treatment, and may not do what they need to do to get better. All this being said, there is a large and beautiful community of OCD sufferers communicating internationally on the internet. These sufferers have used social media to form online support groups and these groups naturally form sub-sections. These subsections reduce the sense of isolation that sufferers feel because they know the people they are communicating with think like they do. For those who engage in a lot of physically noticeable rituals, like washing, cleaning, arranging, and checking, there is the sense that people get it. It’s on TV, and it looks like what people call OCD when they use the word on TV. For people who struggle with primarily mental rituals and intrusive thoughts about violence, sexuality, relationships, religion, morality, and hyperawareness–what gets called “pure O”–there is a sense of being different from the “washers and checkers,” so to speak. There is this feeling of being poorly understood, overlooked, and often misdiagnosed. While I’m the last person to promote tribalism, this sense of togetherness under some name that identifies the lack of physical rituals feels important to the “pure O” sufferer. When I was seeking support on the Internet, I knew right off the top that I didn’t want to be in a digital room of people concerned with things I wasn’t concerned with. I wanted to be in the company of people who feel like they can’t stop thinking about terrible things all the time, people like me. Somehow I knew to seek out a site called “pure_o_ocd” even though I knew the name couldn’t possibly be true. So does “pure O” exist? Well, it depends who’s using the term and what they think it means. If it means OCD with mental rituals and it helps you to have a name that makes you feel less alone, then it exists. If it is some therapist’s marketing ploy or a way to describe a manifestation of OCD thought of as “pure” from compulsions, then no. As for other names that would work better, I haven’t been able to think of any. One day, when stigma around mental illness is a thing of the past, perhaps there won’t be a form of OCD that feels marginalized by society and there won’t be any drive to have a special name for it. If you could share just one piece of advice with someone who has OCD, what would it be? Don’t rely on one piece of advice. If you can access and afford to see an OCD specialist, listen to what they have to say and do the work, all of it, even if the work makes very little sense in the beginning because it’s such the opposite of what you want to do sometimes. If you can’t access a therapist, read several books on OCD, utilize a workbook, educate yourself about the disorder and teach yourself the tools to master it as best you can. Join a support group, follow an OCD blog, go to an IOCDF conference, connect with other OCD sufferers. Take your own advice and pool it together with the advice of people who know about OCD. You’re not alone so don’t be alone.